Most of your images will have more pixels (for printing and making slides, the more pixels the better). To enter a Society projected image competition you must reduce the number of pixels to maximum 1600 wide by 1200 high. You must not have the width more than 1600 and you must not have the height more than 1200 pixels. Your image can have less pixels. If for example you reduce the width to 1600 pixels, and the resulting height is 694 pixels, this is acceptable, but you may want to add some black pixels to the height to make it 1200. In Photoshop, go to "canvas size" and make the height 1200 pixels, background colour black. A band of black will be added to top and a band of black added to the bottom, to give the 1200 pixels. For images in "portrait" mode, with 1200 pixels high, the width pixels will be less than 1600. In this case, bands of black may be added to left and right, to give a canvas width of 1600. The bands of black, do not have to be black. They can be any colour or pattern, but black is usually the preferred colour. To reduce the size of your image. Go to "Image". Go to "image size". tick the 3 boxes at the bottom (scale styles, constraint proportion, resample image). choose "pixels" from the drop-down menu. The images below show examples of the black bands. Why does my image have to be 1600 x 1200 pixels when my camera shoots much bigger? The L&CPU use projectors that shoot at a resolution of 1600 x 1200 pixels, we don't have to abide by this sizing but doing so makes it easier to enter L&CPU & other external competitions if using this universal size. Do I need to include the competition or my name in the image file name? No. The club uses software that automatically sorts images into the correct competitions based on what folders they are in. Do not include a name as images need to remain anonymous. All you need to include in the file name is the image title that matches the title on your entry form. Make sure your title does not include symbols, do not use all capital letters & don't make your title longer than 30 characters long including spaces. How should I name the competition folders? Once you have created a folder with your name you'll then need to create a folder for each section of a competition you are entering within it. Within each competition folder place the correct images. The level: Novice or Open. The competition: Colour, Monochrome, Nature, Set subject or People. The format: PDI or Print. 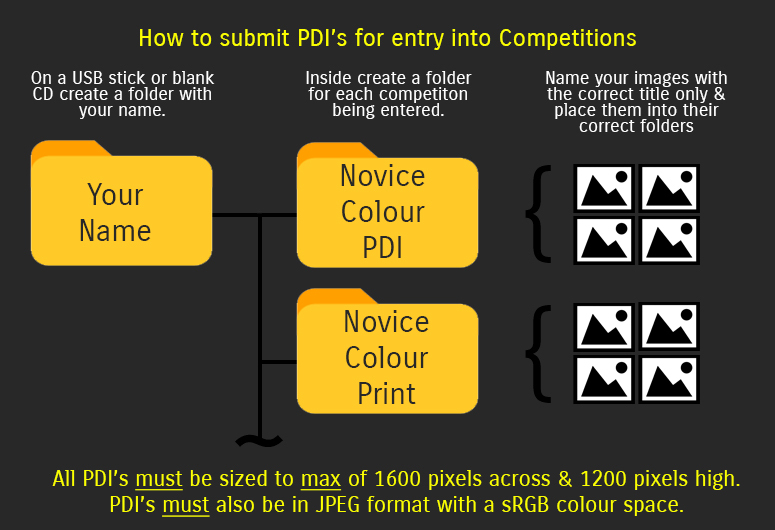 If I'm entering a print section why do I still need to enter a PDI copy of the printed image? Why do PDI's need to have a colour space profile of sRGB? Sometimes different editing softwares, monitors & machines display an image on your screen in their preferred colour profile. For example Adobe Photoshop may try & save your image to 'Adobe RGB'. sRGB (or its full name sRGB IEC61966-2.1) stands for 'standard red green blue' & is a universal profile which will be displayed the same across many platforms. Not using sRGB may make your image have a different cast or colour on your screen at home from the screen set to sRGB that the judge may be using. Most editing softwares have a tab to change colour profiles when you are saving an image, or if using Photoshop click [Edit] then [Convert to profile]. Why do images have to be JPEG can I use TIFF or PNG? A JPEG is a image that has been compressed in size while being efficient. A TIFF or PNG is an image that has not been compressed resulting in the file size to be larger. Although the latter two contain more data the older JPEG format is the preferred choice, just like many of the answers above it's mainly because it is the universal norm & to allow everyone to be on a level playing field when it comes to image data/quality.